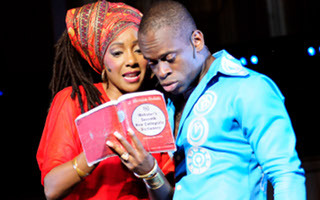 “Fela!” is brave in its implications of the bad guys, from IMF and WTO to Halliburton and AIG. The book by Jim Lewis and Bill T. Jones alludes to exploitation at the hands of huge multinational corporations, and also chronicles specific instances by the Nigerian government. Ngaujah, who steps into Fela’s shoes magnificently, is cutting and clever when he calls out companies/governments for “419,” the Nigerian penal code for fraud, and explains that the colonial powers take/took “petroleum, diamonds and people” from Nigeria and give/gave “gonorrhea and Jesus.” Fela was opposed to colonial rule, but also to that of his own corrupt government, and those like his all over Africa. “Colonial mentality is a hard thing to break,” Fela laments; in his eyes, the Nigerian government seems to have perpetuated some of the same crimes. Lewis and Jones are bold in underscoring the continuing corruption into our current times.